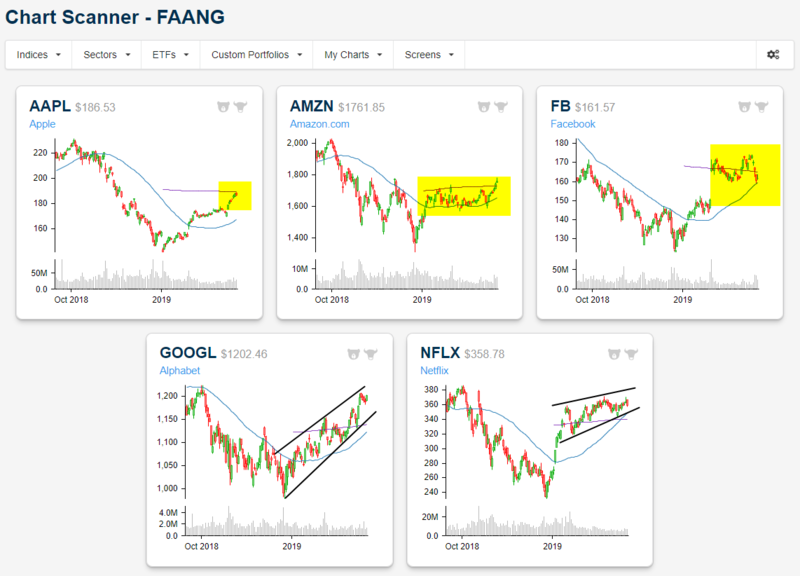 Below is a snapshot of the five FAANG price charts from our Chart Scanner tool that’s available to Bespoke Premium and Bespoke Institutional members. Each stock has its own unique set up right now. Apple (AAPL) has gone from $140 to $185 in less than 3 months, but the move still hasn’t pushed the stock above resistance at its 200-day moving average. Traders will be watching AAPL closely over the next few days ahead of next week’s product event to see if this resistance can be broken. Amazon (AMZN) had been trading in a tight sideways range since early 2019, but gains this week have finally caused shares to break out of this range to the upside. That’s a bullish move. Facebook (FB) has gone in the opposite direction as AMZN over the last five trading days, breaking below its 200-day moving average and testing support at its 50-day moving average. So far the 50-day has held for FB. Alphabet (GOOGL) has made a series of higher highs and higher lows since the end of 2018, and gains over the last week have pushed the stock up near six-month highs. The stock is currently trading right at $1,200/share, and it needs another $100 to test all-time highs made in mid-2018. Finally, Netflix (NFLX) shares shot out of the gate at the start of the post-Christmas rally, but the stock has been consolidating in a relatively tight range over the last couple of months with a slight bias higher. It looks like NFLX will probably remain in this range until it reports earnings on April 16th. As one of the most volatile stocks on earnings in the entire US market, chances are the stock will break out of its tight range either to the upside or the downside following its next earnings report. Start using our popular Chart Scanner tool now with a two-week free trial to Bespoke Premium!